There have been many compilations of classic games released on the PC over the years, but none comes close to the breadth and depth in Atari's 80 Classic Games in One package. With more than 20 arcade hits and 60 classic 2600 titles included, there's plenty for the classic game fan to enjoy. While many titles such as Asteroids and Battlezone have appeared numerous times in other collections, the real joy here is playing 'official' emulated versions of obscure titles such as Red Baron and Liberator, which haven't been commercially released. Join us as we examine why this collection is a great deal for the classic gaming fan. Classic gaming has been growing in popularity over the past few years and numerous compilations have appeared on various systems. While many have done a fine job technically, they usually only offer a dozen or so titles, usually the most popular. However, the trend of giving players only a cursory look back is being challenged by Atari 80 Classic Games In One, an unusually ambitious collection of classic Atari titles spanning the legendary company's arcade and 2600 games. On the arcade front, you'll find many of the expected big hits such as Asteroids & Asteroids Deluxe, Super Breakout, Pong, Missile Command, Tempest and Centipede in this package. All of these are nicely emulated and the package does a good job recreating them with side panel artwork and virtual controls. Other titles include Gravitar, Crystal Castles, Warlords and Millipede. These are accurate emulations as well, and as you'd expect hold up well thanks to their timeless gameplay. However, Atari 80 goes a bit beyond the norm and includes some more obscure titles such as Black Widow, Liberator, Lunar Lander, Major Havoc, Red Baron and Space Duel that have rarely or never been included in commercial compilations. While not as famous as Atari's mega-hits, these lost classics have definitely held up well for the most part. The inclusion of Black Widow and Red Baron in particular is great news for classic gamers, and these two gems have definitely aged nicely. Black Widow is surprisingly addictive, and the first person dog-fighting in the vector based Red Baron is fantastic. Red Baron is the find in this compilation, and definitely a treat for those of us who remember playing it in the arcades back in the day. It was and is a great companion-piece for Battlezone, and worth the price of admission alone. Major Havoc is another obscure title that's been deservedly exhumed, with clever gameplay that mixes many types of genres in a sleek vector interface. Major Havoc was definitely ahead of its time, and playing it now proves that it was a work of undiscovered genius. One of the most surprising games on the disc is Liberator, which is actually based on the Atari Force comics. It's a Missile Command variant, but the graphics are much better, with more sophisticated gameplay mechanics. 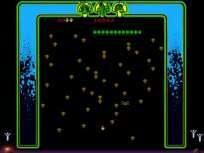 While Asteroids was one of the all time classics and spawned numerous imitators, Atari's own Space Duel added full color vector graphics and more enemy types to make for a surprisingly addictive and challenging game. This selection of arcade classics is impressive, but the developers have gone the extra mile and included dozens of classic 2600 titles as well. Some of these are well-known, with the infamous 'commons' such as Combat, Breakout, Canyon Bomber, Air-Sea Battle, Yars Revenge and Video Pinball along with lesser-known but equally addictive games such as Dodge 'Em, Flag Capture and Canyon Bomber included as well. Players will also find some of the more famous 2600 titles in the compilation including Adventure (the first game with what was then called an 'Easter Egg'), There's a decent selection of board game style games with Video Checkers, Video Chess, Concentration, Slot Machine, Casino and Codebreaker. There are also some interesting educational titles such as Fun with Numbers, Demons to Diamonds, Math Gran Prix and Codebreaker. In the same vein, a somewhat odd choice for inclusion is Basic Programming, which attempted to teach gamers how to program, but seems a little limited these days. Players looking for more action-oriented gaming will find it in games like Street Racer, Night Driver, Haunted House, Maze Craze, Surround, Sky Diver, Star Raiders, and Star Ship. There's a decent selection of sports titles encompassing the console's history including early titles such as Golf, Home Run. These early games are a bit primitive, even by 2600 standards, but the situation improved dramatically with the release of the RealSports line, with Volleyball, Basketball, Baseball, Football that provided much better graphics and more sophisticated gameplay. The compilation also includes later 'red-box' period games like Double Dunk, Super Baseball and Super Football, which show the full evolution of development on the console. While the 2600's arcade translations of Missile Command Centipede, Millipede, Asteroids, Battlezone and Crystal Castles were graphically limited, playing them again on this compilation shows that the oft-cited fact that the gameplay was still intact was true. Sure, today's players probably won't be able to appreciate the effort that went into these, but those who were there will definitely appreciate the effort. Most of these 2600 games are fairly easy to find, even today at thrift stores and garage sales, but Atari 80 includes some rarities that rarely turn up in the wild and command high prices in online auctions. The biggest of these is the infamous "Atari Club" exclusive Quadrun, which featured voice samples, in addition to being impossibly difficult to acquire. It's a fun title, and its appearance on this compilation should please fans without the very deep pockets needed to buy an original copy. Radar Lock isn't nearly as rare as Quadrun, but still a bit pricey, which means many players haven't palyed this cool air-combat title. It's a solid game and quite technically advanced for the system. Two of the three Sears exclusives, Stellar Track and Submarine Commander are also included, and both of these are decent games. Finally, all three games in the SwordQuest series are included, with the last one, WaterWorld one of the rarest in the 2600 library. You can't win one of the jewel-encrusted swords for playing these anymore, but you probably deserve on if you can figure out what's going on. Purchasing all these rarities in the wild would probably cost you hundreds of dollars at the very least, so their inclusion should please gamers who just want to play the games without shelling out for the privilege of owning them. In addition to playing all of these game, players can also view background information included on each title. There are scans of classic advertisements, arcade cabinets, artwork and more that you can scroll through and some of these items are pretty cool and not something you'd ordinarily get a chance to see. Atari 80 also includes a couple of video interview segments with Atari's founder Nolan Bushnell. They're definitely informative and interesting, but unfortunately, these segments have appeared in other compilations. The disc itself is easy to use with a cool menu system based on star constellations. Setting up Atari 80 Classic Games is quite easy, players can install the games onto their hard drives or run from the disc itself. There are several options for each game that allow you to change the difficulty setting or turn the virtual cabinet artwork on or off. As you'd expect, all the games work perfectly on the machine and the emulations are faithful to the original games. From a technical standpoint, the compilation runs all the 2600 titles perfectly as well, though we couldn't figure out how to enlarge the window in which they run. Most of the games work well with a standard USB controller, though the trackball controlled titles seemed to work much better using a mouse as the controller. Overall, the developers have done an excellent job emulating these classic games and have produced a nicely polished package Atarians everywhere will definitely appreciate. Even though many classic fans have become addicted to MAME and various emulators over the years, the emergence of commercial emulation should still hearten gamers wondering why the industry hasn't, to this point, placed more importance on its glorious past. A collection like this proves that there were more than a half-dozen worthy titles released during the classic era, and many of these hidden gems deserve another chance commercially. While a classic console like the 2600 could never have done Red Baron or Major Havoc justice, today's systems can easily reproduce the games perfectly. All the more reason to introduce these titles to a new audience. So, from either a nostalgic or historic perspective, Atari 80 Classic Games is an outstanding value for gamers everywhere, and hopefully, a sign that the decade-long revival is beginning to unearth hidden titles. While the titles here are representative and comprehensive, there's still a few gaps. Aside from games that have clear-cut licensing issues (such as the infamous ET and Raiders for the 2600 and Atari's Star Wars coin-op) we're still hoping commercial ports of more obscure titles like Arabian or I, Robot one day. Still, the glass is definitely half-full and if you want to see more of these collections, you should definitely run out and grab this excellent compilation.